Children may suffer injuries, both common and uncommon. When a young person is hurt, it is important to establish exactly what happened, and to determine whether another party played a role in the incident. Parents of children who have been injured in car accidents or other preventable events in the Manchester area can consult attorney M. Jeanne Trott. Providing compassionate and aggressive pursuit of legal claims, she can work to assert your child’s right to compensation. 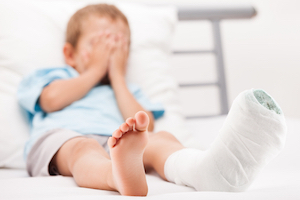 Lawsuits involving injuries to children may proceed under various legal theories, depending on the particular facts and circumstances of the situation. As with any legal claim, it is critical to collect details surrounding the accident. Location is particularly important to ascertain in these cases because an injury in or around school property may involve a lawsuit against the school district or facility. In a case alleging a negligent defendant, the parent of the injured child must prove that the defendant owed a duty of care to the child and breached that duty. It is also necessary to show that the breach directly caused the child’s harm and that actual damages resulted. Generally, the defendant would be required to act as a reasonable person would behave in a similar situation. For example, if the defendant is a homeowner who builds a pool on his property, knowing that a neighbor child often visits the area, that homeowner must take appropriate measures to reduce the risk to the child. This might involve erecting a fence around the pool or placing a conspicuous sign indicating the area is off-limits. Again, these facts would change depending on the homeowner’s awareness of the child, and whether an injury in the pool is foreseeable, among other issues. In another example, negligent supervision may occur when a responsible party fails to adequately supervise a child. Schools and day care operators have a duty to adequately monitor children and ensure their safety. The degree of supervision depends on the child and the activity. A fifth-grade child reading in a classroom may not need as much supervision as a first-grader climbing a playground structure during recess. To determine the level of supervision required, the court may consider the child’s age, the nature of the activity the child is engaged in, and outside factors beyond the supervisor’s control, such as those that take place on a field trip. If there is negligent supervision on the part of a school district or day care facility, and a child suffers harm, the school district may be liable. In a lawsuit involving injury to a child, a court also will typically consider the young person’s behavior. Under New Hampshire law, the standard of conduct required of children is that which is reasonable for other children of similar age, intelligence, and experience, under similar circumstances. In other words, a child is not held to adult standards of behavior. But when children are engaged in an adult activity inappropriate for their age, such as driving a car, the Court may hold them to an adult standard. Injured children are entitled by New Hampshire law to recover compensation for both immediate and long-term costs, including future lost wages. Your child may need both immediate and long-term medical care, including hospitalization bills, physical therapy, and other expensive treatment. Damages also often include subjective amounts for physical and mental suffering. Estimates of potential future medical costs are typically obtained from qualified experts. Your child’s medical and financial welfare deserves competent legal representation. At our firm, accident lawyer M. Jeanne Trott helps New Hampshire children harmed by dog bites as well as other forms of negligence. Contact our office today at (603) 624-7500 or use our online form to arrange a free consultation. We serve clients throughout the state, including in Hillsborough, Rockingham, and Merrimack Counties.